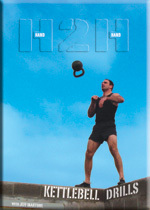 Jeff demonstrates 30 innovative and progressively challenging H2H kettlebell drills that will catapult your explosive strength, stamina, and hand & eye coordination to a whole new level. 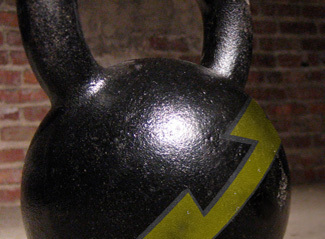 These H2H drills will add a new dimension of variety, enjoyment, and intensity to your current high-repetition kettlebell routines. 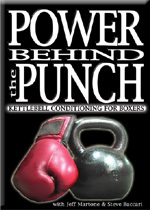 If you have tried and experienced the benefits of the “DARC Swing” as demonstrated by Pavel on his video More Russian Kettlebell Challenges, you will love this DVD! “I got Jeff Martone’s Hand-to-Hand KB Juggling video last week. I’d met Jeff at the Sep RKC Cert, and he had shown us some juggling “tricks,” which are various core exercises I won’t go into here because the video shows them — and more. They really do work the “core” as Jeff points out in the video. I’ve been finding my way through different regimens since injuring my right knee (collateral ligament, I believe) just before the Super Bowl — a fluke that occurred when I turned around (or tried to) while jumping rope. Long story short, after the H2H workout, my right leg had more PAINLESS lateral movement than it had in 6 weeks. It felt good this morning for the first time since Jan. Not sure what happened yesterday w/ the H2H workout or if it was simply a slow improvement based on various RKC/DD Forum inputs & advice. But I’ll be doing more of same. Just recently, I was exposed to the H2H world of conditioning. I can say without a doubt that it is the most effective training program i have ever tried. The results include massive increases in functional strength, greater stamina for combat activities, flexibility progression, improved coordination, and unbelievably little to no muscle soreness and recovery time. 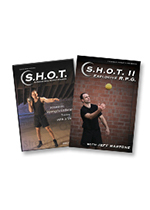 Jeff Martone and his H2H strength training methods are the future of sport specific and functional strength training.